On the face of it, the Igenix IG1190 looks like a promising addition to your kitchen. Of smart appearance and a little more compact than some Halogen ovens, it does have some good design features which I have commented on before, like the hinged lid, a great safety feature. It has a conventional Halogen lamp heater in the lid, overall it looked like it could be a winner. This model has a rotating paddle, similar in design to the Breville Halo range, in principle a good idea, in practice several buyers of this product found that the paddle either broke up the food or the mechanism jammed and broke the turning link between paddle and base requiring a return of the product to the manufacturer. This problem may now have been rectified in production. In the box you will find some tongs, the paddle and a wire stand . The unit is very easily assembled and disassembled for cleaning and for use. The top can be washed in a dishwasher. The plastic body of the unit is not quite as well finished as other models and on the whole it does not have the nice feel of something well designed and made. It does tend to go skipping across the work surface when the fiddly buttons for the lid are pressed ( not easily achieved ) which is a worry. At 1000watts, it is a little more economical than most halogens , but the temperature range is the same , with a max of 250 C. The cable supplied is 1.2metres which is fine for most kitchens and longer than some others. Setting the temperature and time is done with the digital setting panel. The display changes from time to temp depending on the selection you make, Plus and Minus buttons do the adjustments. Time is done in ten minute intervals only. I always prefer two sets of buttons, like the Andrew James Ovens separate time and temp , with both displayed, having to select the display is tedious and can lead to error. I didn’t like the feel of this machine at all, the plastic see through lid , not being glass, will no doubt eventually get scratched and be difficult to use at some future point. I’m not a fan of the paddle arrangement, like other paddle machines, if your chips are delicate or too fresh, they will break up. I can say though that the Igenix does make excellent chips, working as a straightforward Halogen Oven . The major drawback if any, is the size, it is slightly smaller than other makes , which is great on the work surface , very convenient but trying to cook a decent size chicken proved to be difficult, you really don’t want the bird too close to the heat source, the spatter from the cooking will get onto the heating element, the bird will not cook evenly and do you want to squash it down , just to get it in? I can’t believe i’ve not bought one of these sooner. 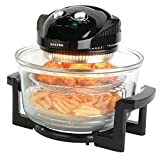 I’ve been looking for something like this for a while as i have never found an oven chip that tastes nice or is healthy and being constantly on a diet and liking chips is something of a challenge. the instructions are basic, and the accompanying book a bit useless, so you will have to experiment, but as a piece of kit, it’s nice looking, usable and efficient. Bought this as a replacement for a halogen oven when I moved to smaller accommodation. Not a patch on the versatility of a halogen. It is really just an expensive grill. Controls are fiddly to set and you need 3 hands to just close the lid. Buy Now OR Add to Amazon Cart.